This technical note will show you how to detect and work with similar emails part of an email chain together after applying Near Duplication to the documents in the data set. This page will help you identify related email families by content in order to identify all the emails in a group, detect missing emails, and give you the option to keep only the relevant final email messages that needs to be reviewed. What is an email thread? Email messages that have similar text representing a conversation thread, including a running list of all the succeeding replies starting with the original email. The replies are visually near the original message, usually in chronological order from the first reply to the most recent (e.g. the original email, then the response to the original, then the response to the response). 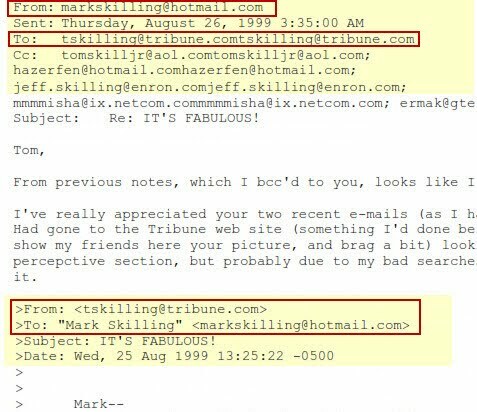 Those emails grow as they go back and forth between two or more recipients. How Does Lexbe eDiscovery Platform treat email threads? ⃝ View email chains with similar text in date order. ⃝ Bulk code similar email and speed review. ⃝ Consistently code email chains for responsiveness, privilege, attorney-eyes only, etc. When Lexbe looks for near duplicates, it runs vertically through the custodian. 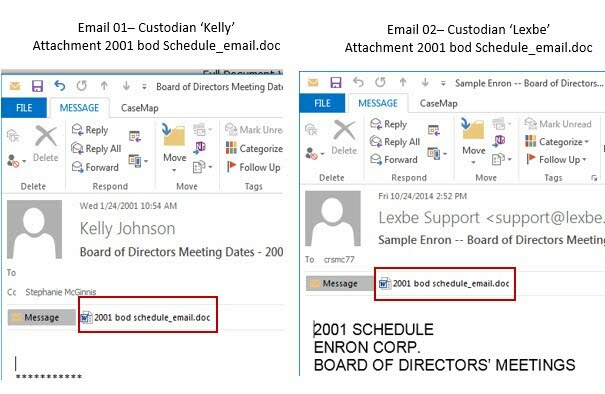 For example, custodian-sender 'John' sent an email with an attachment to several recipients, Lexbe will look vertically in John's documents for near duplicates. Then our system will take both the email and attachment (the entire family), marks them together as near duplicate, and when you delete the John's email you will also delete the attachment. Please note that separate versions of the same document might be attached to different email-custodians, and they are not marked as exact duplicates and retained for email family integrity. So if you find all the duplicates of a document in one custodian, the same document might also appear in a different custodian's documents. How to review emails as similar threads in Lexbe eDiscovery Platform? Step 1. Open the Browse page, go to the 'Field>Show Fields' section and select the following headers: Extension, Subject, Senders, Receivers, Master Date, Date Sent, Near Dup Group, Responsive, Work Product and Privilege. Step 2. 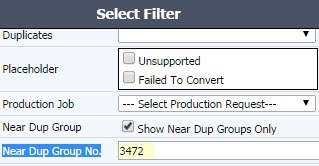 In the section Filter> Select Filter, apply filter on 'Extension = MSG' and 'Near Dup Group>Show Near Dup Groups'. This will display all email within groupings. Also, filter on 'Date Sent' before (a date outside of range) and 'Date After'. Step 3. Save and Share filters you've applied by using the 'Filter Quick Links feature' (e.g. 'Email Threads'). The saved and shared filters allows you to access specific filters for further review and can be viewed by other users in the case. Step 4. If you want to narrow down the results and show only one specific Near Dup Group, you can also apply filters by 'Near Dup Group No. ', for example 3472. Step 5. Sort by 'Master Date' and 'Near Dup Group No.' to view emails within multiple groups. Optionally you can apply filter additionally by 'Group' and then sort by 'Date Sent'. Depending on the size of the filter and groups, you can select and export the results to an Excel spreadsheet using the 'Export Log to Excel' feature from the Browse, and then also sort and filter. For more information please visit our technical page. We also offer Project Management and Technical Services if engaged to support your near-duplicates efforts by helping to execute specific requests for document identification. Please contact your sales rep or our Support Center if needed.